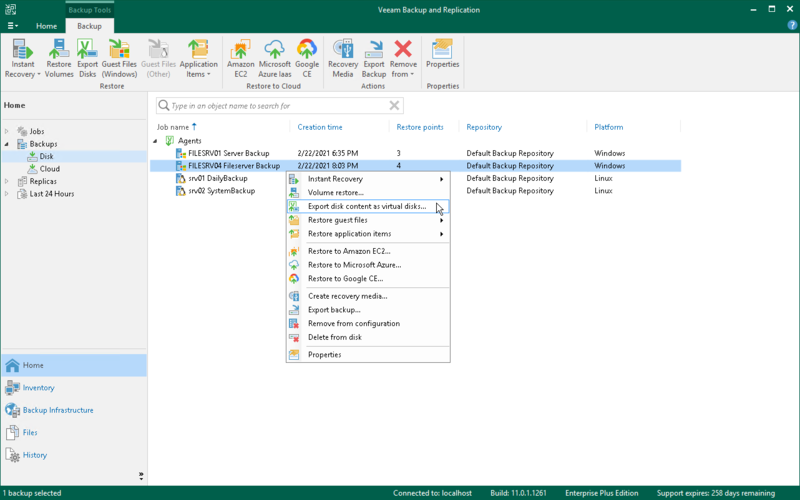 In Veeam Backup & Replication, open the Home tab and click Restore > Agents > Export disk contents as virtual disks. In this case, you will be able to select the necessary Veeam Agent backup at the Backup step of the wizard. [For backups stored on a regular backup repository] In the inventory pane, click Disk under the Backups node. In the working area, expand the Agents node, right-click the necessary backup and select Export disk content as virtual disks. [For backups stored on a cloud repository] In the inventory pane, click Cloud under the Backups node. In the working area, expand the Agents node, right-click the necessary backup and select Export disk content as virtual disks.